22 VDMA 2016 • VDMA MINING SUPPLEMENT saved through a vertical emergency shaft, thanks to drilling rigs from Bauer Maschinen Group. The disaster in the gypsum mine, which buried 28 miners, occurred on December 25, 2015. Eleven of them were rescued immediately, though one died during the accident. Thirteen miners are still missing. Four min- ers were able to escape to an enclosed space and signaled from there that they were alive. During the very first days after the collapse of the mine, a small supply hole was drilled so that food and clothing could be supplied. The necessary rescue equipment was also sent straight to the mine. The most important system was a deep rotary drilling rig, the Prakla RB-T 90, which was designed and built in Germany a few years ago specifically for Chinese mine collapses; six machines were delivered. The concept was developed in the Bauer Equipment segment. No low-loader is required; instead, the unit is constructed on a trailer with four axles and only needs a tractor rig. This means that the machine can be put into operation quickly. The China Rescue Organization holds the units at various locations in China in standby mode. When they were required at the end of Decem- ber, the drilling rig was dispatched for immediate use after an entire year on standby. Two additional Bauer units were also in operation to drill the emergen- cy shaft, a BG 26 and a BG 38. With these, pre-drilled holes were bored, before the RB-T 90 rig drilled down more than 200 m. The difficult nature of the geology posed a large technical challenge for the rescue mission, as the ground was very unstable due to the various layers of material, consistencies, water inflow and sinkholes. At first, the hole could not be stabilized and in the end, casings had to be used to support the hole. A large team from Bauer was in operation, which also included many specialists from Schrobenhausen, who were already involved in the development of the RB-T 90 deep drilling rig. Bauer continuously mon- itored the operations during the whole action. 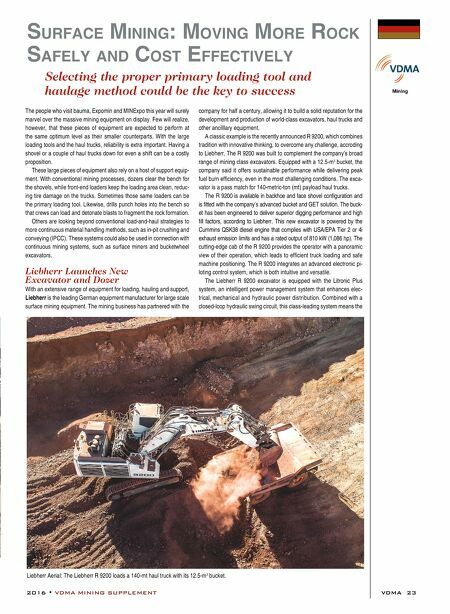 "We are proud that, thanks to our modern machines, we are in a position to offer crucial assistance in such difficult situations and also that the Prakla RB-T 90 passed its acid test," said Dieter Stetter, managing director for Bauer Maschinen GmbH. 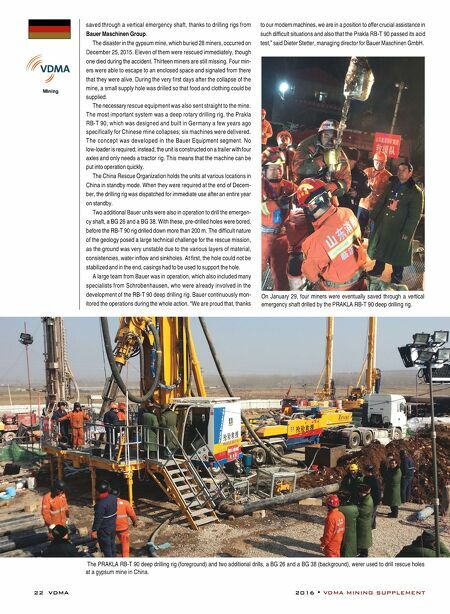 On January 29, four miners were eventually saved through a vertical emergency shaft drilled by the PRAKLA RB-T 90 deep drilling rig. The PRAKLA RB-T 90 deep drilling rig (foreground) and two additional drills, a BG 26 and a BG 38 (background), werer used to drill rescue holes at a gypsum mine in China.